We have Completed Sailings for The 2018 Season. Thank you all so much for making it Arrr-some!!! let’s adventure together in 2019!! Ahoy mateys! 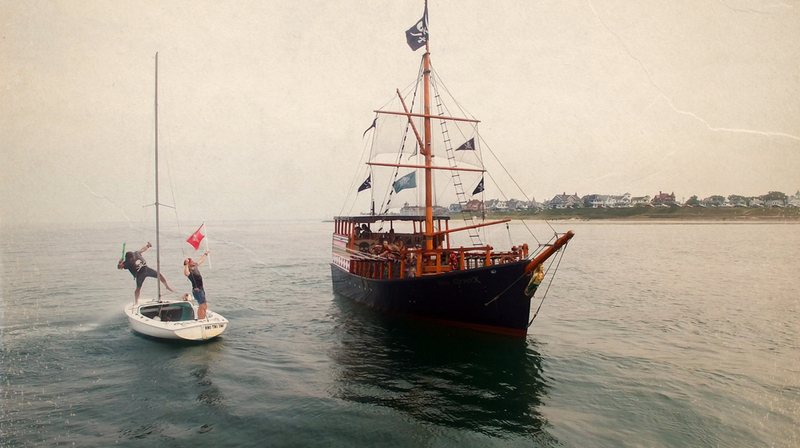 Join us as we set sail on a pirate's treasure hunt along the shores of beautiful and historic Oak Bluffs on the legendary island of Martha's Vineyard. On our custom built pirate ship, your kids will dress and talk like pirates, assemble a treasure map, battle rival pirates with water cannons, and hoist sunken treasure from the ocean floor! (a pirate family of course). Come join our crew! 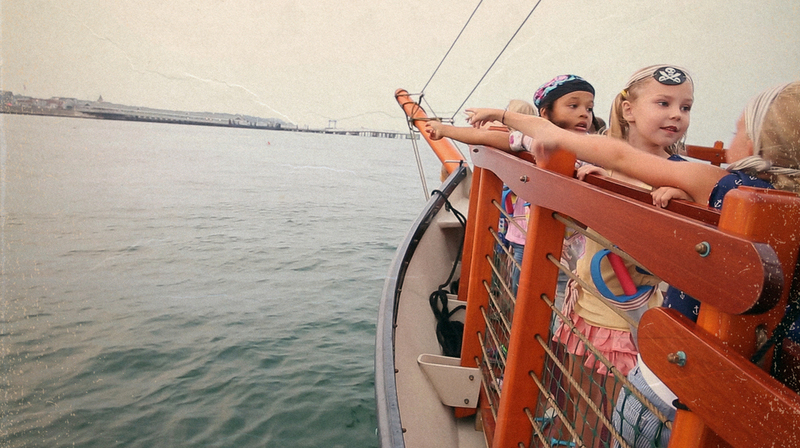 Our custom-made 40-foot vessel is designed just for kids! The Sea Gypsy is it’s a stage at sea - a safe, magical place for imagination to take over and memories to be made. 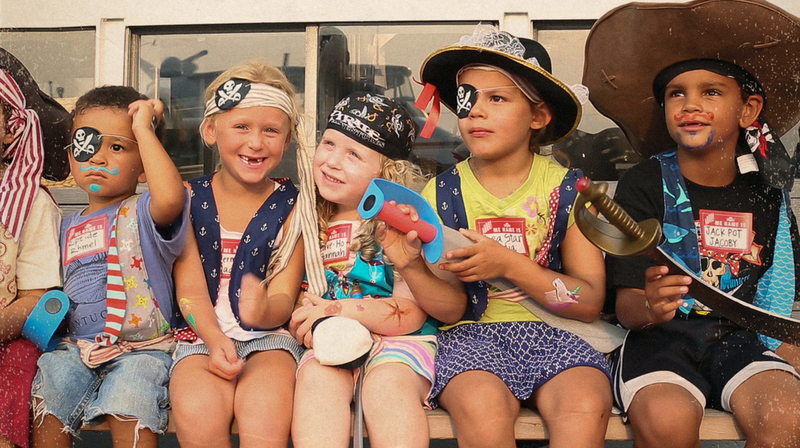 From beginning to end, the action is non-stop as we transform your kids into our hearty pirate crew. Every new mate gets a pirate name, face-paint, dresses up and learns how to talk like a pirate - all before we leave the shore! Once aboard the Sea Gypsy, we must work together to build a treasure map and determine our course. Along the way, we find a message in a bottle and discover that a traitor is out to get our treasure! We must raise the battle flag and fight off our enemy with water cannons to protect our treasure! The voyage culminates as we discover where "X" marks the spot...then we must work as a team (heave-ho!) to raise the treasure chest from the ocean, as it's heavy with sea water and sparkling booty. Every one of the crew will be rewarded for their efforts and take home their fair share of the loot. There’s singin’, dancin’, and drinkin’ of pirate grog as we sail back to port, victorious in our spoils. You’ll be amazed how quickly the Pirate Adventures Crew taps into the wonder of your child’s imagination. This wholesome, family-oriented cruise is a perfect thing to do on a day trip, vacation, weekend, or really just about anytime you are seeking a child-friendly and action-packed bunch of fun while on MV. There is a reason why Pirate Adventures is ranked high on a family’s vacation highlights. This isn’t a performance by actors - this is a highly interactive pirate experience where each of our trained crew makes sure your child is involved and engaged throughout the whole journey. Ideally suited for kids 3-10, our adventures are custom designed to make your experience a safe one. Our captain is United States Coast Guard (U.S.C.G.) licensed, trained in First Aid and CPR. The Sea Gypsy "X" is a U.S.C.G. inspected vessel equipped with lifejackets for everyone on board - your little mates' safety is our first priority. Our ship does not go “out too far,” so you will be close to shore for the entire adventure. Our goal is to provide wholesome, safe summer memories your family will treasure for a lifetime! Setting Sail for summer memories! NOTE: The above represents your arrival time so that your child can get pirated with face painting, dress up and revelry - the boat leaves 15-20 mins after time listed. There are always some exceptions to the schedule and route based on customer loads, wind speed and direction. The shoulder season (May, June, Sept.) will have fewer trips depending on interest and weather. You can see our up-to-date schedule, availability and book online in the "book now" calendar; or you can call us to check when we will be out huntin’ for treasure. Reservations are required! We prefer you book in advance, but we do take walk-ups which will close 15 minutes before the boat leaves. All those aboard must hold a ticket - even baby pirates - those are the Coast Guard rules. For adults and kids over one you can book online or call. If you have an "infant in arms" please call to book. Children are the responsibility of parents - we require one responsible adult pirate per group of five little pirates. DUKES COUNTY RESIDENTS: We love Islander Pirates! 10% discount for year-rounders with valid Island-based license. Sorry, discount does not apply to additional non-resident guests in your party and cannot be combined with other offers. If you book online, we will apply credit back to your card when you show your ID at check-in. Please arrive AT your booking time, this is the time we begin face painting, dress up and revelry. Ship sets sail approximately 30 minutes after the listed time. At least one adult is necessary to be responsible for the behavior and safety of the group of kids you're bringing. An "Infant in Arms" must be under 12 mos. old and sitting in your lap, or in a carrier, on board. Please call to book. Coast Guard regulations allow us to carry up to 45 passengers on our ship, regardless of their age or size. Each passenger, (even baby pirates) counts towards our occupancy limit so be sure to have an accurate number when making reservations. Check-in inside Dockside Marketplace at the Treasure Chest - our pirate store. You may bring your own snacks and drinks, but only what you can carry. Space is limited and glass is not allowed. Carry in, carry out! Bring sunscreen, jackets, sweatshirts, ponchos or what you will need to make your family comfortable at sea. Remember, it's colder on the ocean, and you may take on light sea spray from the cannon fire. There are no bathrooms on the boat, please use the bathrooms inside Dockside Marketplace before leaving. Strollers are not allowed unless they breakdown completely. We can keep them safe for you our store or outside at our Pirates In Training (PIT) area. Duration of the adventure is approximately 90 minutes total, time at sea is approximately 60 minutes. Finding parking in Oak Bluffs is like huntin' for treasure. Unfortunately, we have no pirate parking available. The best places to hunt are: around Ocean Park, at the top of the bluff by the Steamship dock, around the head of the Harbor, alongside the ocean across from Ocean Park. Please leave ample time to find parking as we cannot hold the boat for you. Customers can cancel no later than 24 hours prior to their arrival date and time to receive a full refund. Customers who cancel after the 24 hour period will not be eligible for a refund. No-shows will not be refunded. If you do not cancel before the 24 hour cancelation policy time, and miss your scheduled sailing time, your credit card will be charged the full amount – no exceptions – we held the space for you and hoped you would have joined us. Customers may make changes to the reservation without any fees, as long as it's outside the 24 hour cancellation period. For private parties or groups, see our additional cancellation policy. We sail in most conditions including light rain. Call us if you are unsure! However, we reserve the right to cancel any trip in the event of heavy rain, thunderstorms, high winds or any condition that the Captain deems unsafe. We need at least 8 kids, 4 adults minimum to sail (total on trip) so everyone will have a fun time. Any less, is just too few to facilitate the trip. If we do have to cancel a trip due to load or weather, we will attempt to book you on another trip or will refund the charge in full. We will notify you by text/email/phone at least one hour in advance of your booking time if the trip is cancelled. "IN SEARCH OF THE GOLDEN LIGHT"
2.25 hour cruise aboard the beautiful pirate vessel Sea Gypsy X. Leaving from Oak Bluffs Harbor cruising through Nantucket Sound and back in search of the “golden light”. comfort of our guests, crew and boat is paramount. We reserve the right to refuse service to anyone at any time and will return to port to do so. So keep it arrrsome and come toast to your good fortune while seeing the beautiful shores of the Vineyard and Cape. Imagine a sunset sail with your friends, family or co-workers aboard your very own pirate ship! The Sea Gypsy X is a spacious, well-crafted passenger vessel with plenty of space to mingle and enjoy your guests. It can accommodate up to 42 adults with seating for 15 covered and about 20 uncovered depending on your configuration. Our latest craze is our private Pirate Adventure PLUS a Sunset Cruise combo. Imagine enjoying drinks and food at sea while our pirate crew entertain your littles! We can give you a private pirate adventure for the first hour and then carry on with our traditional sunset cruise, it's the best of all worlds! Cost is $800 minimum for up to 20 guests and $50 for each additional guest up to 42 total guests. Pirate Adventure + Sunset Combo! Private parties require rental of the whole boat and are BYOG (Grog). We can provide cups, napkins and utensils for a small fee. We can also assist with boat-appropriate catering from several local and onsite Oak Bluffs restaurants that have created special menus for the Sea Gypsy sailings. Call to discuss pricing and the special details of your event. Let us help you bring out the pirate in your crew (you know there is one!) and create a memorable cruise through Vineyard Sound. We offer a variety of ways for you to celebrate your child’s birthday for parties. All Pirate Adventures' Birthday Parties include 30 minutes of face-painting and dress-up before the boat departs and a 60-minute cruise aboard the pirate ship Sea Gypsy X. The kids are entertained from the minute you arrive, and the time aboard the ship is filled with non-stop action for all of your guests. Pirate dress-up session with clothes and "tattoos"
Charter your own private day-based Pirate Adventure! $800 minimum fee covers 25 pirates (kids and adults), each additional pirate is $29 for up to 42 pirates total. Please Note: We require a 50% deposit at time of booking. The remaining 50% will be charged 24 hrs before your date and time of sail, at which time the payments become non-refundable (unless we cancel due to weather and you can't be rescheduled). Cannot be combined with any other discounts, including the "Infant in Arms" rate. We do not do privates at 10:30 sailing in July or Aug. This is for daytime adventures only. Pirates are passengers. Route and duration may vary based on weather and load. This is a discounted rate, but not a private boat. If you guarantee a minimum of 20 pirates or more (including adults and children), you will receive a discounted per person rate of $29.00 but your party will run within a regularly scheduled trip. Your birthday pirate will also receive a free pirate pack and extra attention from our pirate crew! Please Note: We will reserve the maximum number of tickets you think you will need for your group and then refine your numbers up to 24 hours in advance. You will be charged a minimum of 20 people to receive the discounted rate of $29.00 per person. Cannot be combined with any other discounts. This is for daytime adventures only. Route and duration may vary based on weather and load. WE CAN PROVIDE THE FAVORS! Our Pirate Packs make great take-home favors. For $10 each child gets an MV Pirates skulldana, foam sword and an eyepatch before the sail. Or, you can also make selections from our complete pirate store, The Treasure Chest. WE WANT TO MAKE YOUR PIRATE PARTY FUN & EASY! Learn about where and how oysters are grown, and meet the people behind their story. Enjoy an insider’s tour of a working oyster farm by boat. Experience the world of oysters first hand! Learning about where oysters are grown, how they're grown, and who grows them will elevate your oyster appreciation to new heights. Our oyster adventures are Thursday nights from 5:45-8:00 pm starting June 21st, 2018. Contact Farm.Field.Sea at the links above for ticketing and additional information. Guests will meet at the dock of Pirate Adventures Martha's Vineyard. Once we set sail, we dive into a talk with biologist Rick Karney from the Martha's Vineyard Shellfish Group to learn what aquaculture is all about. At Cottage City Oyster farm, purveyors Dan and Greg Martino will introduce us to their nursery, upwellers and invite us to see the harvest process in action. Our adventure is topped off with a fabulous tasting and shucking demo of fresh oysters plucked right from the waters around you and a sunset sail around the Oak Bluffs harbor. Cancellation Policy: For Farm.Field.Sea. ticketed events, refunds are not available. You are welcome to transfer your reservation to friends, family, or to that nice person you met on Craigslist. We require that you contact us with an e-mail address for the new ticket holder five days prior to the event. If we need to cancel the event because of inclement weather, you can either book another adventure, or we will refund you your full fee. Pirate Adventures Martha’s Vineyard is locally owned and operated by Captain Flint (Jeremiah) and his family - Lady Pearl (wife, Catherine), and sons Dagger (7) and Cannon (4). 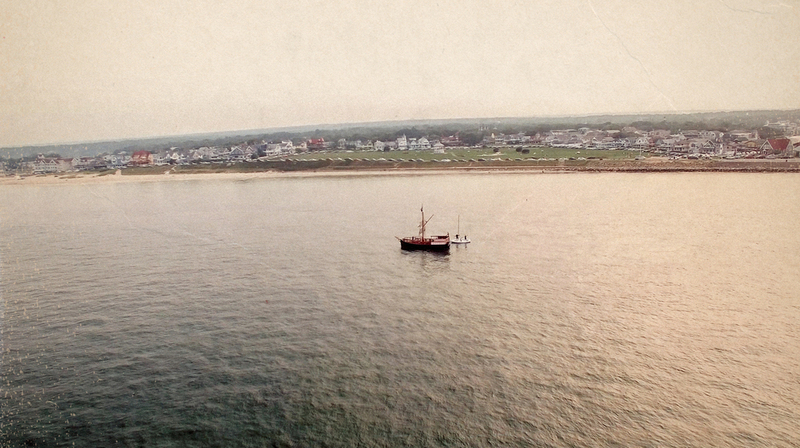 The Captain was born and raised in Oak Bluffs, and has dreamed of being a pirate from any early age. He has spent his life on the waters around Martha’s Vineyard and at Dockside Marketplace and Marina - our pirate home. The goal of Pirate Adventures is to create a wholesome, sight-seeing adventure for locals and visitors, while cultivating a fun, safe space where imagination rules the high seas! The Sea Gypsy "X" was commissioned in 2014, custom designed in Maine, and finished by hand on Cape Cod. She was built to U.S. Coast Guard specifications and designed to provide the safest environment possible for you and your family. Her overall length is 40 feet, her width is 15 feet wide and she displaces 21 gross tons. She is powered by two 90 hp Yamaha outboard engines. She is equipped with all of the latest life-saving equipment, including life jackets, life rings, and a ship-to-shore radio. She is expertly designed with covered tiered seating for about 15 adults in the shade with additional uncovered seating close to the action so you can take lots of photos. Unfortunately, the Sea Gypsy is not guaranteed to be handicap-accessible, but we will do all we can to get you on board. On the Sea Gypsy's voyage, we may run into a few scallywags along the way, so be prepared to man the lookout- or we might make you walk the plank! Each crew member is carefully chosen based upon their charismatic pirate personas and enthusiastic interaction with children and adults alike. Our professional Pirate Crew is committed to entertaining and engaging your entire family while on board our ship. They will make sure your tour is spent with a lot of laughter, surprises and great memories that your family will cherish for a lifetime. Capt’n Flint is an Islander, born and raised in Oak Bluffs and at Dockside Marina. He has spent his entire life with salt in his hair and splinters in his toes. After a stint as an attorney, Flint could no longer bear the shame of that profession, and opted for a more respectable life as a Sea Dog. Capt'n Flint holds a USCG Certified Master’s License is CPR and First Aid Certified and holds a PhD in Pirate Linguistics. Lady Pearl is the brains of the crew and makes sure all aboard are properly outfiitted, organized and ready to plunder. She is still determining when to use "arrrrr" or "arrrgh," but loves to yell "aye-aye." Mrs. Pearl is always setting course for the next treasure seekin' adventure and has been known to make more than a few of the crew walk the plank! OUR SUMMER 2017 PIRATE CREW - READY TO ADVENTURE WITH YOU! Returning for her fourth season in 2018, Coral is an original pirate on the Sea Gypsy X, the first-mate and head of the pirates, under Captain Flint. But don't let this pirate's sweet face fool you - she'll plunder like the rest of the scurvy dogs. She's been known to make use of the cannons to keep the pirates in ship-shape. Coral graduated in fall of 2016 with a Bachelors in Psychology & Education, and a Certificate of Developmental Disabilities & Human Services from the University of Massachusetts Amherst. Hailing from the Adriatic Seas of Croatia, Shackle washed up on the shores of the Vineyard in the Summer of 2016. At first glance, this pirate is quite intimidating, with luscious dark hair, standing at a staggering 4 anchors tall. However, his actual given name is Shrimp. He is especially known for his patience with the younger pirates (as they often like to use his him as a jungle gym) and his expertise in foam sword duels. Shackle graduated from the University of Zagreb with both a Bachelors and Masters in Mechanical Engineering and a concentration in Material Sciences. We love this pirate from our head to our bones! Bones is from a far away land called California. It's a magical place filled with whales and ships, but sadly no pirates. So Bones searched and searched until he found his perfect pirate crew, us! This is his first year with our pirate family but he is quickly growing into the fierce pirate we all know he will be. Aka Young Gup, aka Gup, aka Young Gup Finch, this zany and hysterical pirate was a new addition to the crew our second summer. One day while hauling up the treasure chest from the bottom of the sea, instead of being face-to-face with our bounty, we were looking into the big eyes of this curly-headed pirate at the end of our line. And boy, are we glad we did. Young Gup, although demure in stature, has proved a fierce asset to our crew. Guppy is a junior at Mount Holyoke College. We bumped into Bubbles last summer 2017, and are so happy she decided to join us to pirate again this summer. Much like her name, she is a smiling and happy pirate. Although... her name may come from how she can't help but blow bubbles in her grog! She swims like a mermaid through the sea and her energy gives her a great advantage on our adventures. If you see Bubbles give her a nice "AHOY!" and you're sure to hear one back. Bubbles is a junior at Martha's Vineyard Regional High School. Look who we found lootin' through our treasure chest, it's Skully! She may seem sweet here, but when it comes to treasure this pirate means business. Her warm smile won over the hearts of our pirate crew, and we were more than happy to have her join us for our 2018 season. 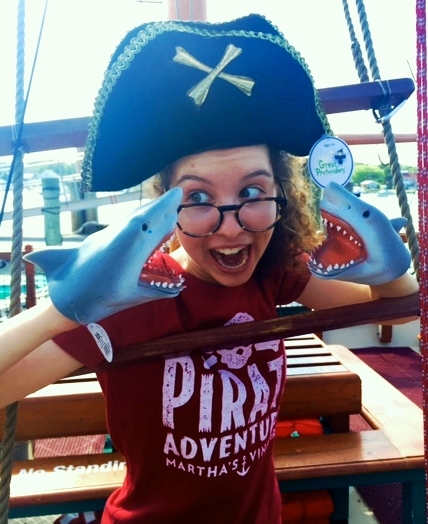 She loves a good game of pirate tic-tac-toe so make sure to challenge her when you see her on the harbor! Hector is the Pirates of the Caribbean enthusiast in our crew, and part of the original pirate crew back in 2015. In the spirit of Jack Sparrow, Hector made his way to us across the Atlantic Ocean from the Republic of Georgia, on the back of two sea turtle shells strapped together. Hector quickly became part of the pirate family, with his charming personality and unwavering support for our crew. Hector graduated with a Bachelors in Business Administration from the American University in Bulgaria, and is currently attending the Lee Strasberg Theatre & Film Institute of New York City. One day while out on the water, a bold pirate tried to take our pirate ship by force. With nothing but the oar from her skiff, this pirate tried to plunder our whole crew. We liked her moxy, and so Skiff became a part of our crew in 2017. This pirate is a friend to all and one of our hardest working pirates. She has quickly moved up through the ranks and looks forward to pirating every summer! Skiff is a junior at Martha's Vineyard Regional High School. Are you ready to meet Jetty? Earlier this summer, as we were leaving on one of our adventures, we heard a small pirate's voice calling out to us from the Jetty. When we didn't respond, she dove off and forced her way onto the boat. We were so impressed we took her in on the spot, and so Jetty was born a Sea Gypsy! Although, we should have named her speedboat cause when she drives she FLIES! Keep your eyes peeled for a quick moving ship and you might catch a glimpse of Jetty. Scarlett sailed with Pirate Adventures for two consecutive seasons. Her enchanting singing voice has been known to charm many a merman and sailor alike. Native of the island, Scarlett knows these waters like the back of her hand. Our ship is her stage, but beware: Scarlett is known for stealing other pirates' lines. Scarlett is a senior at the University of Vermont. Bootstrap is one of the original pirates from the first year we voyaged in 2015. One day while out fishing off the shore, a large figure floated up to us in the water. We took it to be the a threat and were ready to fight, when a bottle of grog was tossed aboard. This Hawaiian pirate came to us as surprise, and a blessing. Bootstrap is our "good time" pirate, and we think of him often. We always tell the tales of Bootstrap to the new pirates of our crew; there's really no one out there like him. Also known as "Wudda" by our crew (and many of the younger pirates still learning their A, B, Seas...), Rudder sailed with us since our first summer in 2015. He's always been our "boat guy," with the most extensive knowledge of all things nautical. The Captain loves Rudder so much that it's been rumored he is betrothed to the Captain's unborn daughter. Rudder is a sophomore at Harvey Mudd College. Hawkeye was the youngest member of the Sea Gypsy family our first summer, and has been known to take a beating from his crew, but always does so with a smile on his face. His quirky and silly personality is adored by all. Hawkeye is also known for lurking around the pirate ship or Dockside, even on his days off! Hawkeye graduated from Northbridge Junior - Senior High School in 2017. + ARE THERE BATHROOMS ON BOARD? No, but there are restrooms available inside Dockside Marketplace. Please use the land-based bathrooms before you board! +HOW LONG WILL THE CRUISE LAST? About 70 mins at sea and 20 minutes on land. Whatever you need to feel comfortable on a boat,- jacket, sunglasses, hoodie, sunscreen and a camera usually covers it. +CAN I BRING A STROLLER? The boat can accommodate small foldable umbrella strollers. We can keep your big double stroller (City Mini, Bob etc) on the dock and have it ready when you reach the shore. You should show up at your booking time, which is 20 minutes prior to the ship's departure time. This is so your child / children may be dressed in pirate gear and have their face painted. +DO I NEED A RESERVATION? Yes, as we have a limited capacity aboard the ship for any sailing time. This capacity count includes all people on board including infants through adults and is set by the Coast Guard. We will not be able to accommodate even the smallest passenger once we reach maximum capacity. No exceptions can be made. If we have space or cancellation at time of leaving we can sell you a ticket right there. +HOW DO I MAKE A RESERVATION? Book online at www.mvpirates.com or you can call us at (508) MVP-CREW/ (508) 687-2739. +CAN I BUY A TICKET AT CHECK-IN ON THE DOCK? We never want anyone to miss out on an opportunity to sail the high seas, so if there is a “no show”, we would be happy to sell a ticket on the spot. +IS THERE ANY FOOD OR DRINKS ON THE BOAT? No, we do not sell any food or beverages on board, but feel free to bring your own snack or drink, within reason. Please pack in, pack out. Water may be purchased at the dock. There is a Black Dog Café To Go right where we depart as well as several restaurants up and down the Harbor. +WHERE DO WE CHECK IN? Check in inside the Dockside Marketplace on the Oak Bluffs Harbor—look for the blue and white striped awnings. This is at 12 Circuit Ave Ext, which is a continuation of the main street that passes through OB, but headed toward the Harbor. Inside, you will see the Pirate Adventures Treasure Chest Kiosk. You will then be directed to the outside dress up and staging area where we will meet the crew and prepare to sail. You will be escorted from the dress up area to the boat by the crew. +IS THERE PARKING? HOW DO I GET THERE? Arrrgh! Unfortunately, we have no private parking so arrive early to ensure plundering a spot. There is public parking around the Harbor, at the top of the hill by Lookout Tavern, around Ocean Park and on Circuit Ave (the main drag). You can also take a cab directly to the Oak Bluffs Harbor. We are right across from the Dockside Inn and right up the Harbor from Nancy’s – the restaurant with the big shark out front. +IS THIS SCARY FOR THE KIDS? We are extremely child friendly and our program is geared to involve all the children. We are gentle, happy pirates…not scary ones. Your children will have become part of our pirate family during the trip! +IS THIS FUN FOR GIRLS TOO? Absolutely! Our young lady mates often outnumber the boys! Throughout history there have been many infamous female pirates that have sailed the seven seas. + WE ARE A SMALL FAMILY, IS THIS OKAY? Families of all sizes are welcome! Our trips are fun for families of two or twenty. All will take part in the adventure! +DO WE NEED TO BRING LIFE JACKETS? We have enough life jackets for everyone. However, our life jackets are built for safety rather than comfort. You are more than welcome to bring your own life vest from home. However, since The Sea Gypsy X is a Coast Guard certified vessel our mini-mates are not required to wear them while onboard. +DO WE LEAVE THE DOCK? Yes. We are an interactive treasure hunt for children and we sail around up the shore of Oak Bluffs just past Inkwell Beach. +ARE THE WATERS ROUGH? WILL I GET SEA SICK? We sail in Nantucket Sound which are partially protected waters. The Sound is generally calm depending on wind-direction, but a slight chop is not unheard of. Our vessel is extremely stable and our goal is your comfort and safety. If it’s too rough, we do not sail. +WHAT HAPPENS DURING THE WATER CANNON BATTLES? Me friends, a pirate doesn't like to discuss the rough life at sea. However, we will tell you this - when we find the scurvy dog that stole something important related to our treasure chest, we will turn on our water cannons and engage in battle for as long at it takes until we win those items back! Piracy is not for the faint of heart! When our water cannons go off, you may get misted during battle. Especially if the scallywag we are chasing fires back! However, there are areas of the boat where you can go if you'd like to stay dry, but no guarantees-we are a vessel at sea! +WHAT IS THE LAYOUT OF THE BOAT? The Sea Gypsy X has a large open floor plan with a covered stadium seating area for 20 people and additional seating in the sun. There is shade to safely and comfortably sit with a small child. +WILL WE BRING HOME PIRATE TREASURE? +DO YOU SELL PIRATE GOODIES? We have an entire Pirate Kiosk full of amazing pirate treasure, themed items and gifts! Check us out so you can get outfitted before the big adventure. We also sell premade pirate accessory packs at a discounted rate - eyepatch, foam cutlass, skulldana - all waiting for you at check in - just click on pirate accessory pack when booking online. We sail in a light rain or drizzle, but we do not sail if the captain determines the conditions, to be unsafe. If your trip is cancelled we will attempt to contact you at least one hour prior to sailing with a reschedule or full refund. +WHAT HAPPENS IF SEVERE WEATHER IS IN THE FORECAST FOR MY CRUISE? If severe weather is in the forecast for Oak Bluffs, our captain might have to cancel a cruise. If this is the case, we would notify ticket holders via email and text message as soon as that decision was made. At that point, we will refund your credit card. +WHAT IF WE EXPERIENCE SEVERE WEATHER DURING OUR CRUISE? The Captain might make the decision to return to the dock if severe weather occurs during your cruise. If you experienced the majority of your cruise before the captain made that decision, then no accommodations would be made. If you experienced less than half of your cruise, then we will give you a full refund. +IS THE BOAT COAST GUARD CERTIFIED? The Sea Gypsy is a United Stated Coast Guard certified vessel and safety is our number one priority. If anyone is acting unruly or is harmful to themselves or others, the boat will return to the dock and our security will have these guests removed. In addition, we have the right to deny boarding to any person at any time. Safety is our first priority and entertainment is our second, so please sail responsibly. +IS THE BOAT WHEELCHAIR ACCESSIBLE? Sadly, no, the dock does not have wheelchair access due to tidal changes (which alter harbor levels) throughout the day. +CAN I STOW MY BELONGINGS SOMEWHERE ON BOARD DURING THE CRUISE? You'd like to give a ship full of pirates all of ye possessions? Me mates don't think this is such a good idea so we do not have an area to stow people's belongings at this time. You may keep your bag etc. in the seating area on the ship, but you are responsible for your your own booty. +CAN I RENT OUT THE ENTIRE PIRATE SHIP FOR A PRIVATE PARTY? Yes! For all private charter inquiries, please email ahoy@mvpirates.com or call 508.MVP.CREW to setup your private event. Yes, gift certificates are available and make perfect gifts for holidays, birthdays or any other occasion! To purchase a gift certificate, please call us or click purchase gift certificate through the online booking system. We have beautuful printed certificates we will fill out for you with your little pirate's name and a special message and we will mail it for you. +CAN I BOOK A BIRTHDAY PARTY ONLINE? We believe birthday parties are very special and personal. If you are interested in booking a birthday party, please contact us by email or call so we can ensure you have a birthday party to remember. +WILL THERE BE A HOST FOR MY PARTY? For private parties, yes, you will be greeted by your pirate host who will stay with you and your party for your time with us. On regular trips we have a staff of 5 attending throughout the time from shore to ship. +HOW LONG WILL WE HAVE FOR THE PARTY? The adventure is 90 minutes total. If you have a private party we will try to arrange for 30 additional minutes for you on land. +CAN I DO A DROP OFF PARTY? Unfortunately we are unable to offer drop off birthday parties. 1 adult must go on the boat for every 5 kids. +CAN I BRING MY OWN FOOD OR DRINK? You may! You can bring cupcakes to have on the boat or we can try to arrange space for you in the Pirates in Training area picnic table if the date and time work out. No glass, but you can bring waters or juice boxes. The kids are actively engaged for the whole adventure, but we can create space for cupcakes. +DO I NEED TO PAY A DEPOSIT FOR MY BIRTHDAY PARTY? If you are booking the private boat, we require payment for half of the amount up front. If you are booking a party as party of a regular cruise you will be charged for the maximum number of people that may come to reserve the space and we will credit you back at final headcount. +IS THERE A CANCELATION PERIOD? For private boats, bookings can be cancelled with a full refund up to 1 week prior to the booking. Any bookings cancelled within the week of the party will be non-refundable. Reservations of 20 plus (not including full boat parties), can cancel or amend within 48 hours of sailing time. Reservations of less than 10 passengers can cancel or amend their numbers within 24 hours of sailing time. It is very important that your entire party arrives on time. Due to their popularity, our boat is booked throughout the day back to back, so we cannot allocate you extra time if you are late. The Sea Gypsy X is docked at the Dockside Marketplace & Marina on the Oak Bluffs Harbor. We are on the right side of the harbor when looking out to sea. Circuit Ave Extension is the name of the road as you head away from downtown on Circuit Ave (the main street). Please note public parking is scarce, so leave yourself plenty of time to park. There is limited public parking on the Bluff, around the Harbor and on and around Circuit Ave. If you approach from the Harbor side, you will see us in The P.I.T. (Pirates in Training) right on the bricks out front. Please go inside the Mall (far right entrance door) to check in at the "Treasure Chest" and then come back outside to the staging area for pirate training. Everyone will meet and stay at the staging area where you will be escorted onto the private dock by a crew member to begin our voyage on the Sea Gypsy X. We're located inside of Dockside Marketplace at 12 Circuit Ave. Extension. The "Extension" of Circuit Ave. is a continuation of the main street through Oak Bluffs, but heading toward the Harbor. We are right across from the Dockside Inn and where the Hy-line Ferry comes in. Once you found the Dockside building, head into the blue awning and look for The Treasure Chest Pirate Shop on your left hand side heading toward the water. © 2015 PIRATE ADVENTURES® MARTHA'S VINEYARD. ALL RIGHTS RESERVED. PIRATE ADVENTURES® MARTHA'S VINEYARD IS A REGISTERED LICENSEE OF THE PIRATE ADVENTURES® CORPORATION.